In the past basement insulation was often overlooked. Typically basement walls were cinder blocks and that was it. Now there are so many options from a construction standpoint, you really need to do your homework to see what suits your home building situation. Layer on top of that all the options there are for insulating your basement, and you’ve got your work cut out for you. Insulating your basement goes a long way to reducing your energy bills, and increasing the comfort of the occupants living inside the home. Even if your basement is a storage catch-all, or a place to sequester unruly family members, there is great value in making your basement warm through the use of insulation. The main advantage basements have, compared to the rest of the house, is it’s surrounded by soil. And the deeper you go, the more the temperature of the soil levels off around 50-60 degrees. Even at 4′, the temperature starts to hold its own verses air temperature above. 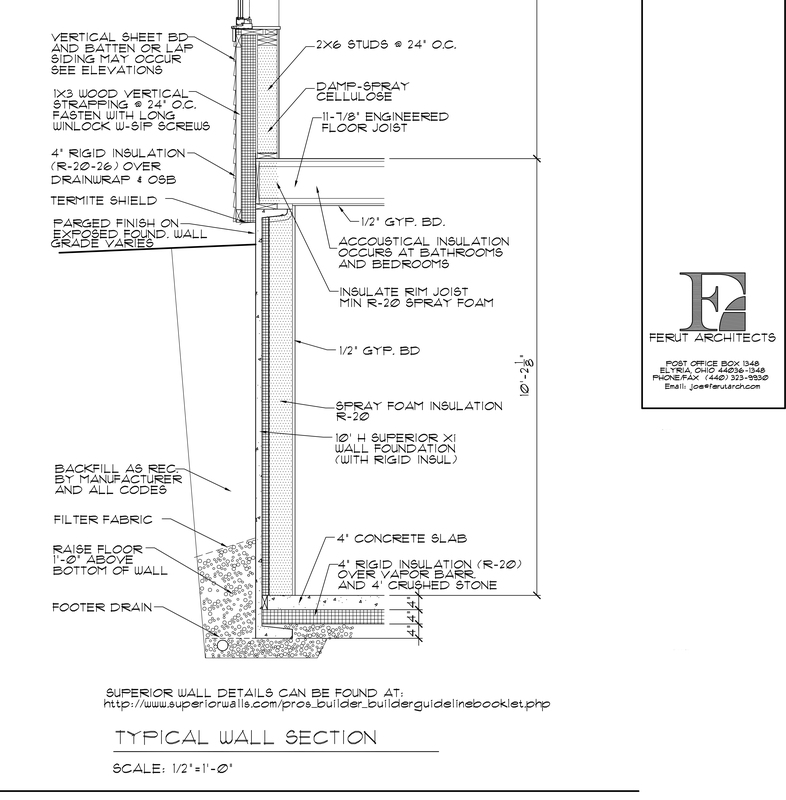 So, taking a look at the diagram, you can see our awesome Superior walls make up our foundation. They’re awesome because they are prefabricated cement and include R-15 of rigid insulation right from the factory. Check out this post to see how they were installed. It was amazing. The plan was to add 3″ of sprayed 2 pound insulation to the inside of the Superior walls; adding R-20 to our R-15 walls for a phenomenal R-35 insulation rating to our basement walls. Also note we already have R-20 (4″ of rigid) under the cement floor. The basement would be warm snuggly nest once we were done. Well turns out due to cost restraints we needed to dial it back a bit. What we did was in all of the areas that were getting drywalled, we had our friends at R-Tek Insulation in sunny Barberton, Ohio, spray 1.5 inches of insulation on just the top 4′ of the 10′ walls. This gives that area an added R-10 of insulation, for a total of R-25. This is better than most foundations, and worlds apart from traditional uninsulated cinder block walls. The spray foam provides an air tight and presumably water tight, or at least water-resistant seal on the walls. Once the drywall is on, our basement should prove to be more air tight. The combination of air tightness and increased insulation should lower our HERS rating from its current level at 41. I’m not sure if I’ll get the house tested again. Maybe down the road after I do a few other things (to be determined). By the way, spray insulation must be covered with sheet rock (drywall) as I do think there are fire concerns with the material when it’s simply exposed. We limited our spray only to those areas where there would be drywall. The storage rooms did not get any additional insulation at this time. For reference on a scale from 0-150 the average home has a HERS rating of 130. New homes have to have a 100 rating. A zero energy house (which we hope to be someday) is 0. Our house is about 59% more efficient than your typical new house. The cost for our additional insulation was $2,000. To do the entire top to bottom at R-20 would have likely been $8,000 or more. The white colored spray foam expands as it dries. It also creates a air tight, water tight barrier. The top 4′ are insulated with 1.5″ of 2lb. spray insulation (R-10). Another option instead of spray insulation would be adding more polystyrene rigid insulation. Check out the Superior website here, for more information. You simply cut and install the rigid, bonding it to the existing rigid in the walls using liquid nails or other non-foam attacking adhesive. In fact this is what I will do for the storage rooms where we won’t have drywall. Because the spray insulation needs to be covered, per code, putting rigid in the storage rooms is my only option really. So strangely enough we will likely get a full R-20 floor to ceiling in the storage rooms because I just have to pay for material. It’s a super simple DIY job that I can do myself – free labor! Actually in hind sight, I should have likely done this everywhere from the get go, but I already had the insulation guys lined up. No worries, I like the spray insulation. And down the road if we really want to I’m sure we can go back in to the exterior walls and spray more (would have to replace drywall though). One other note, I don’t think you ever want spray paper based insulation in your basement. With all the potential natural moisture issues, like the potential for flooding, in a basement, paper based insulation (like we have upstairs) is a bad idea. There you have it. Now onto finishing framing and building some storage shelves.